No doubt you’ve heard about the man who set the cruise control on his Winnebago at 70mph, went in the back to make himself a coffee, crashed, and then sued the car manufacturers and won? This is the stuff of urban legend, but given the rise in ludicrous and nonsensical compensation claims that occupy our courts, no-one could be blamed for believing it to be true. As absurd health and safety rulings mean that children are required to wear industrial goggles to play conkers, and trees are cut down to stop children climbing them, the word ‘accident’ is becoming a thing of the past. Ambulance-chasing lawyers and no-win-no-fee arrangements urge us to find blame where there is a claim. Our ludicrous and ever-growing compensation culture spirals in and out of control. Would you be justified in filing a McSuit after one too many burgers? If a coconut fell on your head in Jamaica, would you really consider suing your holiday operator? Could you reasonably claim ’emotional distress’ from seeing doctors at work in a hospital? Unbelievably, the answer to all of these is a mind-boggling ‘yes’. 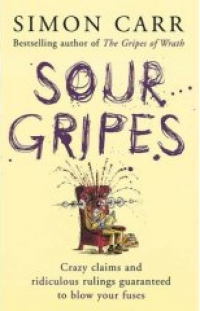 In “Sour Gripes”, Simon Carr presents a fascinating account of barmy claims and their ridiculous outcomes, and alerts us to one terrifying fact: you don’t have to be directly injured to receive compensation and you don’t have to have done anything wrong to get sued. Confused? Incensed? Intrigued? Then this book is for you.